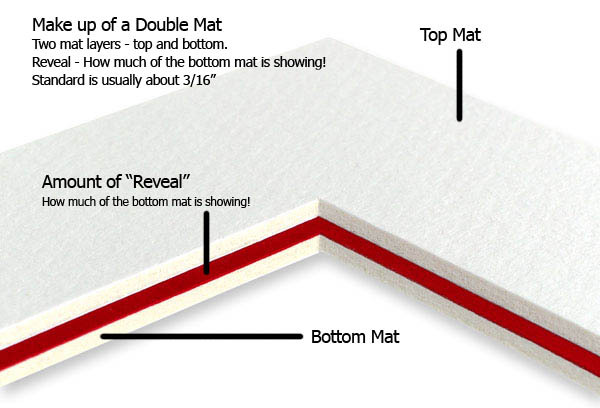 Standard mats are generally about 1/16" of an inch thick and are comprised of a surface paper, core and backing paper. All mats carried by MatShop are considered acid-free, however only Conservation and Rag Mats are truly archival and suitable for museum level framing. Essential mats are rendered PH neutral by buffering the mat with an alkaline solution. This treatment will degrade over time and with exposure to UV rays. The life span for Essential mats is between 10 - 25 years and is totally dependent on the exposure of the board to light. Therefore these mats are best used for and matched to work that is destined to be decorative or with a similar life span. Ideal for cards, small photos, presentations, awards, decorative prints, posters etc. For limited edition work, original work or high-end photographic and giclee prints that are expected to have a long life span - choose Conservation or Rag mats. 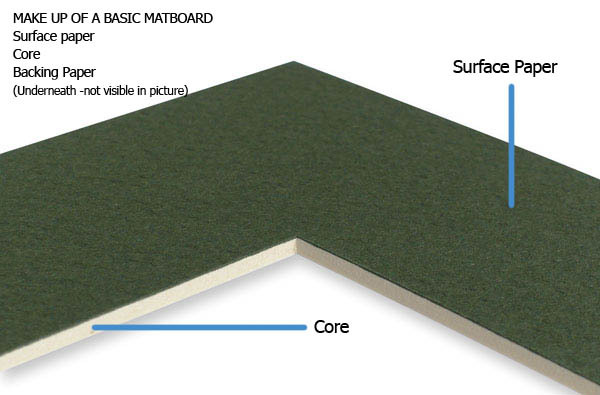 Single mats comprise a single layer - or one matboard. Double mats use two layers so that the bottom layer can show a border around the image - usually in a different color than the top mat. The amount of this color that is shown is referred to as the "Reveal" as it indicates how much of the bottom mat is to be revealed to the viewer. A standard amount of reveal is 3/16". Please note: When you choose a reveal size - it includes the bevel cut on the mat. Therefore a 3/16" reveal will only show 1/8" of the color of the under-mat as 1/16" will be the bevel cut. See the illustrations below for further clarity on single and double mats.